Lounge Piranhas is a band which gives me feeling that I will be able to tell my grandchildren that I used to listen to Lounge Piranhas when they used to perform in pubs and sell their own CDs. 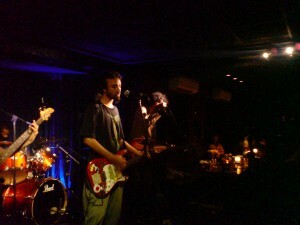 This is a 4 piece Bangalore band formed in 2005 and can be called an alternative/punk band. They are the coolest Indian alternative rock outfit I have seen. They have a distinctive and very trippy sound. They are very adept in fusing of different genres of rock and roll. And what more, they have a didgeridoo and morsing player who appears as a guest in some tracks. I had been waiting for a Lounge Piranha gig for a while. Last Wednesday, there were playing at a pub near my place and I decided not to give it a miss. I was there at the venue pretty early, as last time I reached for a LP gig a month late! But then that’s a different story all together. LP started with a track called Going Nowhere, which is also the name of their album. It is also the first track in the album. Its almost an instrumental piece with a very prominent base line and has a very psychedelic feel to it. There is a didgeridoo sound hovering around and some atmospheric sounds of a radio slightly out of tune. The rhythm guitar reminds me of a Floyd song, but it is the lead guitar which gives the song a Piranha touch. It keeps singing, it’s neither wailing or moaning, Abhijeet Tambe’s guitar kind of sings, that makes Abhijeet a singer with two voices. Later the song loses its Floyd touch, that’s when the lyrics begin and slowly catches tempo and ends in a high note. After this I lost track of the song order, but I bought a CD after the gig. This review is a based on the songs on the CD. The next track on the CD is called Gun Song. Its my favorite track of the album and will get you banging your head, Kamal Singh (the other guitarist and vocalist and lyricist of most of the songs) voice is at it’s best in this song. The main riff of the song is what makes the song really cool, it has that thing which makes you like a song in the first listen, that magical combination of musical notes. This song kind of defines the Lounge Piranha sound for me, a cocktail of alternative, punk, grunge and post grunge rock. Next song was my favorite LP before I listened to Gun Song. It’s called Ebb and it’s a beautiful song with a nice rhythm. It goes like this “Sugar sweet with a taste of bitter, I couldn’t ask for more!”. This a song which you can sing along. I am pretty bad at decoding lyrics, I need a Wikipedia page to understand song meanings, which sadly doesn’t exist for these LP songs. But that day will come for sure. LP often performs in small venues and is known to do surprise covers and often treats you with some new songs. They did play some new songs at the gig I attended, there was this song on a MES college in Malleswaram and another one on Bajrang Bali, this one was almost a protest song. The new songs were a bit louder and more of a pop-punk style. LP’s CD has got the best album art I have seen on an Indian CD, George Mathen the drummer of the band is also an artist, all what you get to see on the album as well as the site is his handiwork. He will be releasing a graphic novel shortly. LP has a fantastic website, all designed by Mr. Mathen I believe, it’s worth a visit. There are some songs available for download as well. Lounge Piranha is a band waiting to explode and made known. If you are alternative rock kind of person, and love your Floyd and Coldplay and Radiohead. Go and buy a copy of “Going Nowhere”, you won’t be disappointed.